If you are a member of the Oregon cannabis community, you have most likely heard people say, or post on social media, that the Oregon Medical Marijuana Program (OMMP) is dead. While some unnecessary laws and regulations have hurt the ability of many cannabis growers to continue providing for as many as they were previously, the OMMP is alive and well, thanks to many dedicated providers and activists. It has certainly been a long, strange trip for the Oregon cannabis community since, well since forever probably, but certainly since the state voted to legalize cannabis by passing Measure 91 in 2014. While I certainly do not regret helping end cannabis prohibition in Oregon, when I discuss the cannabis scene since the implementation of M91, I usually bring up the Western classic, “The Good, the Bad and the Ugly” as there have certainly been unfortunate laws and policies enacted the past few years. Despite the text of M91 that stated the legalization should not impact the OMMP, legislators, many who have been skeptical of the OMMP and various lobbying groups successfully, have taken the opportunity to further regulate the growing of medical cannabis. Those that have been lobbying at the Oregon Legislature for several years know that regulations were ultimately inevitable. It was only a matter of time before more regulations were enacted, mostly due to a handful of bad actors tarnishing the OMMP. Despite the regulations, tens of thousands of patients are still being helped by the Oregon Medical Marijuana Program. Over 60,000 patients are still registered with the OMMP, each receiving the ability to maintain their own medical cannabis garden (or have someone else cultivate for them), avoid the 17% to 20% tax that localities impose on recreational cannabis sales and a wider selection of medical-grade cannabis products. And in spite of plant limitations, compassionate growers are still finding ways to help many patients receive free or low-cost medicine. Recently, the OMMP issued new plant limit directives following the passage of Oregon House Bill 2198, a bill that includes some good things, such as the establishment of the Oregon Cannabis Commission that will advocate for positive policies for our patients and allowing qualified growers sell up to 20 pounds yearly into the recreational system. 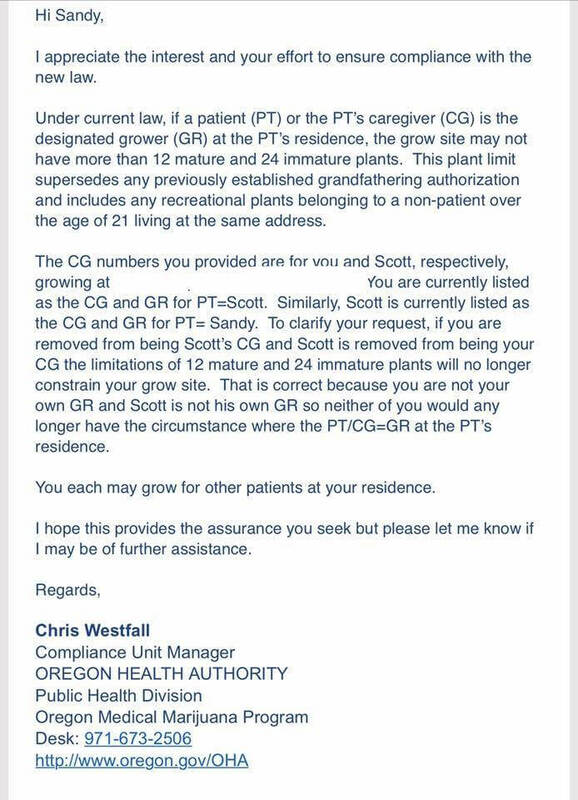 Unfortunately, a provision of HB 2198 is nonsensically being interpreted by the state to limit the number of plants allowed at a residence address where a patient (or the patient’s caregiver) is also a grower at that residence. Yes, it is a hassle to have to jump through so many unnecessary hoops, but the OMMP remains one of the best medical marijuana systems in the world, and navigating these hoops help improve the lives of so many patients. There are still more than 61,000 patients and over 25,000 grow sites across the great state of Oregon. Through Duff Johnson Consulting’s work matching patient and growers and helping qualify patients at Ashland and Northwest Alternative Health, not to mention the benefits we see among our family and friends, I see the benefits of the OMMP firsthand in helping patients lives and will continue working with advocates to protect and improve our state’s medical program. While the changes to the program and entire political process can seem maddening, working together can help OMMP activists roll back burdensome rules and improve the lives of patients. In addition to implementing more common-sense rules to help growers cultivate effectively for patients, we will be advocating that the state establish a low-income patient program and provide greater access to the commercial market for OMMP growers. Don’t fall for the “OMMP is dead” rhetoric. Don’t give up. Join forces with other advocates and organizations to continue to fight for the OMMP. I have seen amazing work accomplished by so many tremendous Oregon activists over the years, that I, and many others, will never give up the fight. The Oregon Medical Marijuana Program is too valuable and too helpful and it remains a great benefit for tens of thousands of sick and disabled Oregonians. Long live the OMMP! I didn’t know what to expect when interviewing New York City mayoral candidate Mike Tolkin. Some third-party candidates can be very eccentric and New York has had it’s fair share; it is home to the Rent is Too Damn High Party after all. After talking to Mr. Tolkin, I can attest that this cannabis legalization supporter, who is currently living as a homeless person to publicize income inequality, is an extremely smart and thoughtful candidate that is running for office for the right reasons. Tolkin has received quite a bit of media attention by spending a week homeless in front of New York City Hall. He has relied upon the kindness of others and he has been pleasantly surprised by the support that he has received from well-wishers passing by. Tolkin will end his homeless occupation on Tuesday, October 10th. Below is the conversation I had with the the third-party NYC mayoral candidate. Anthony Johnson: Why go homeless? Mike Tolkin: Homelessness is one of our biggest challenges. The fact that New York City has 60,000 homeless people speaks to a larger epidemic of economic injustice. People are being displaced with rising rent costs. Looking at the economy, 5 to 10 years from now, our economy will drastically change. Automation and e-commerce are hurting small businesses. We need to be investing and preparing our kids for the economy of the future. We need to put in place policies like a universal income. I went homeless before, without any media attention, to learn about what people are going through and to learn about solutions. I want people to see the human side of homelessness. Many times, people look the other away, because it is too painful to see people living on the streets. There will be more political action if people have sympathy. We need, for starters, more rehabilitation centers and mental health services. Do you see a relation between the stigma of drug use, the lack of drug treatment services, and the homeless population? 100%. There are a variety of reasons why people end up on the streets. People exhaust every single option to avoid becoming homeless, calling up every friend and family member. Substance abuse problems, mental health issues, PTSD, LGBT runaways, are just some of the reasons people become homeless. My proposal, NYC Life, would provide safe housing, job training and mental health and substance abuse treatment. Today’s shelters are unsafe, a big reason why people choose to be on the streets instead of in shelters. I am 100% in support of marijuana legalization. I was nervous to be public about this at first, but I decided to be authentic. I don’t drink, but I’ve vaped cannabis and it has helped improve my life. People have access to marijuana already, so we can make money off of the market, or we can waste money on arrests, imprisonment and ruining lives. It has turned into a plus for my campaign. Other primary candidates then jumped on board after I was outspoken on the issue. Not only does marijuana provide health benefits, but it also can help promote job opportunities. There are a multitude of jobs that can be created, that can benefit people, not to mention the many innovations that can benefit society and create jobs as well. We have too many politicians that don’t have the strength of their convictions. They don’t even have the strength of being on the right side of history, even though they see where history is going. Many personally support legalization and can see that marijuana is likely to be legal in 5 to 10 years, and yet they are still afraid. Don’t you want to be on the right side of history? Mayor de Blasio has touted that marijuana possession arrests have decreased in NYC, but they actually increased in 2016 from 2015. Is there a disconnect between de Blasio’s rhetoric and the reality on the ground? The disconnect between Mayor de Blasio’s rhetoric and the facts on the ground are across the board. There have been a number of reports that he is a user himself. How can you use it yourself and not support legalization? What should people do to learn more about your campaign? Go to TolkinForMayor.com to learn more and check out our videos, including one we’ve made about the need for marijuana reform. Be sure to join other cannabis legalization activists and entrepreneurs at the International Cannabis Business Conference in beautiful Kauai, Hawaii, December 1st thru the 3rd. After Kauai, the ICBC travels to San Francisco, February 1st-2nd, just one month after California is scheduled to legalize cannabis commerce for all adults. Maui Grown Therapies and Oahu’s Aloha Green Apothecary are the only two medical cannabis dispensaries legally operating under Hawaiian law, both first opening their doors in August. Like many states working out the kinks of a newly established dispensary system, bureaucratic hurdles hindered the Hawaiian dispensaries initially, but their state government seems to be looking for solutions to assist state-regulated dispensaries, including establishing a cashless system that can alleviate some of the problems associated with a lack of access to banking services, an issue plaguing cannabis businesses across the country, and the world. Despite the problems associated of opening up a new business, let alone a federally illegal one, the Hawaii’s only two dispensaries generated over $426,000 in sales. According to data for the state Department of Health, the dispensaries sold 8,890 products and had a combined 7,845 customer visits. In its presentation to the legislative oversight group for medical cannabis on Wednesday, the DOH said on average, customers bought 3.3 grams and spent $54.33 per purchase. The department also said there were more than 18,600 registered patients as of August, which represents an increase of 615 from the month before. Fortunately, registered patients in Hawaii now have better access to medical marijuana. Unfortunately, the average price of a gram is $16.45, too much of a price for many patients, especially those on a fixed income. As more dispensaries come online, the price should start dropping for patients. However, demand will increase as more patients get registered with the program, as expected, and when Hawaii starts allowing state-licensed patients from across the nation utilize Hawaiian dispensaries. Hawaii’s medical cannabis dispensary system will only grow over the coming years and we can expect the Aloha State to legalize for all adults within a few years, becoming one of the first states to end prohibition thru its state legislature. As Hawaii’s cannabis system expands, hopefully the state can learn from the successes of others, as well as look for ways to improve upon what other locales have done. For instance it would be great to see Hawaii, or any state, implement policies to ensure all patients have safe access to a safe medicine, such as a establishing a program to assist patients battling poverty. I look forward to learning more about Hawaii’s system, networking, and sharing ideas with business owners, investors, and activists at the upcoming International Cannabis Business Conference in Kauai at the beginning of December, just one month before the state is expected to start accepting the medical cards from other states and California begins full legalization for all adults. While many hurdles remain for Hawaii, and the global cannabis legalization movement, it is clear that we have the momentum and are seeing great progress state by state, country by country. The cannabis community was rocked when the Republican-led House Rules Committee nonsensically prohibited a vote on the Rohrabacher-Blumenauer Amendment, and a whole host of other positive cannabis law reform measures. The Rohrabacher-Blumenauer Amendment, sponsored by Republican Dana Rohrabacher and Democrat Earl Blumenauer, protects state-legal medical marijuana patients and providers from federal prosecution. Blocking a vote on Rohrabacher-Blumenauer was especially egregious as the amendment had passed with growing bipartisan support for four years in a row and a supermajority of American voters support medical cannabis and the right of states to implement their own cannabis laws. However thankfully, we now have a three-month reprieve under a debt and disaster relief bill first passed by the Senate. The House then followed suit and passed the debt deal as well. While the cannabis community was shocked to see state medical marijuana programs potentially threatened by the Jeff Sessions Justice Department, politicos, particularly GOP congressional leaders, were stunned to hear that Donald Trump had agreed to a debt relief bill with the Democrats. The deal, now passed by both chambers of Congress, pushes another huge budget bill vote back to December. All political wrangling and partisanship aside, the debt deal is good news for the cannabis community, as the deal includes the Rohrabacher-Blumenauer Amendment. We now have three months to organize and mobilize to ensure that the Rohrabacher-Blumenauer Amendment gets the vote it deserves. A handful of Republican members on the House Rules Committee should not be able to override the will of tens of millions of voters who overwhelmingly support medical cannabis. It will be imperative that the cannabis community remain vigilant and make our voices heard in the Halls of Congress loud and clear. Congressmen Rohrabacher and Blumenauer have both spoken at the International Cannabis Business Conference multiple times. The ICBC is the cannabis event to learn the latest regarding cannabis business, politics and activism. The next ICBC, in beautiful Kauai, Hawaii, on December 1st thru the 3rd, will be a great opportunity to learn about the latest policy developments and how the cannabis community can organize effectively to ensure that the Rohrabacher-Blumenauer Amendment is passed so we can continue protecting medical cannabis patients and their providers from federal prosecution. Germany has made great strides improving its cannabis laws in recent years, but there is still so much work to be done, as too many patients are still without safe access to a safe medicine. There was understandably great hope that Germany would start treating marijuana the same as any other medicine, after the country implemented an expansion of the burgeoning medical program, but too many bureaucratic hurdles remain. Hoping to fulfill the practical notion that cannabis should be treated the same as any other prescribed medicine, Dr. Franjo Grotenhermen, on of the world’s preeminent medical cannabis experts, has announced a hunger strike until Germany sufficiently opens up the medical cannabis program to all patients in need. I had the honor of meeting Dr. Grotenhermen when he spoke at the International Cannabis Business Conference in Berlin last year, and the man’s dedication to the cause, and expert knowledge, were evident to all in attendance. I hope when the ICBC returns to Berlin in 2018, that Dr. Grotenhermen can reflect on how his efforts have successfully brought medical cannabis fully into the medical mainstream. Rüthen: On August 17, 2017, the German cannabis expert Franjo Grotenhermen entered an indefinite hunger strike. The objective of refusing to accept any food is to decriminalize all citizens who need cannabis to treat their serious diseases. On March 10, 2017, a much-debated law on cannabis as a medicine went into effect in Germany. It was the declared aim of the legislature to allow all patients who need a therapy with cannabis medicines to do so. The law, however, proves itself in practice as too bureaucratic. Therefore, treatment with cannabis and cannabinoids is unattractive for doctors who in principle support such therapy. Many patients do not find a doctor who allows them legal access to the needed treatment. Already today, the German Narcotics Law allows prosecutors to stop a criminal case in the case of a “minor debt”. This possibility is mainly applied in cases of possession of small amounts of cannabis. Grotenhermen urges that criminal proceedings should in principle also be stopped if accused citizens need cannabis for medical reasons. “The need for a cannabis therapy should not be judged by the judiciary, a government agency or a health insurance company, but, as with other medical treatments, also by a doctor,” explains Grotenhermen. He also strongly supports the uncomplicated access of patients to standardized preparations from the pharmacy. In this respect, it is necessary to improve the existing law. However, the prosecution of the remaining losers of the legal situation must also be ended. “I am not aware of a convincing argument by which patients’ prosecution can be maintained,” adds Grotenhermen. A corresponding amendment to the Narcotics Act is, therefore, logical and unavoidable. From 7 pm a 21-minute video will be presented on a special website (www.cannabis-hungerstrike.de), in which Grotenhermen explains in detail the background and goals of his hunger strike. On May 12, 2017, he had already begun a short 8-day “warning hunger strike”, by which he wanted to draw attention to a problem associated with the new law. Health Committee of the German Bundestag on the medical use of cannabis products, most recently in September 2016. Despite the nonsensical naysaying by Reefer Madness prohibitionists, medical cannabis now enjoys mainstream acceptance across the United States, (and support is increasing around the world). Whether it be for chronic pain relief, the treatment of post-traumatic stress symptoms, nausea caused by chemotherapy, or a whole host of medical issues, a supermajority of Americans agree that patients should have safe access to medical marijuana when recommended by their doctor. Despite the extreme bureaucratic hurdles placed in front of researchers, numerous peer-reviewed studies have concluded that cannabis is indeed medicine. Hawaiians are certainly no different as more than 18,000 patients have already registered with the state’s medical program. Aloha State officials are now expecting a surge in patient numbers now that regulated dispensaries are now coming online (although not without some regulatory hiccups). “With other states that have similar size programs, we’ve seen up to a 50 percent increase in the first year. We’ve had for our program, from inception to date, about a steady 20 percent per year, so we’re expecting at least 20 percent, up to 50 percent,” said Scottina Ruis, coordinator for the state’s medical cannabis registry program. More than 18,000 patients have now joined the state’s medical cannabis registry. “They see a light at the end of the tunnel. It has been a long road since 2000 to today, where we have an opportunity for patients to actually get their medicine from a licensed dispensary with products that have been tested by a laboratory,” explained Ruis. As more medical dispensaries open, and cannabis continues to become even more mainstream, it makes sense that more Hawaiians will seek out legal access to a safe medicine recommended by their doctor. As Hawaii News Now noted, state officials are taking notice to plan for a dramatic increase in patients, including the hiring of more staffers. After Oregon’s medical cannabis dispensary system was implemented, the patient registry peaked with more than 70,000 patients (after legalizing for all adults and prohibiting out-of-state residents, the number of registered patients sits at nearly 62,000). Hawaii, with about 35% of the population of Oregon, could easily see the number of registered Aloha State patients hit 24,500 or so, a 36% increase, in no time. With an increase in dispensaries and patients, and the state starting to recognize out-of-state patients at the beginning of 2018, it will certainly be a great time to attend the International Cannabis Business Conference in beautiful Kauai this December. (Full disclosure, I am proud to help organize the ICBC). It will be great to see entrepreneurs and advocates from around the nation, and world, converge upon Hawaii to network and learn as we continue the global movement to provide safe access to patients and eventually end the criminal prosecution of all adults who utilize cannabis. State Legislatures Want to End Cannabis Prohibition, Will Congress Act? On the heels of New Jersey Senator Cory Booker introducing the “Marijuana Justice Act” to repeal cannabis prohibition, the National Conference of State Legislatures has joined the call for legalization, urging the federal government to remove marijuana from the list of controlled substances. This is the second year in a row that the NCSL has passed such a resolution. It is a sign of the growing support for legalization and the fact that state governments are facing serious complications fully following the will of their voters due to federal law. The people and state legislatures want to end cannabis prohibition, when will Congress act on the needs of their constituents. Poll after poll shows that the number of marijuana prohibitionists are shrinking greatly in our nation. A majority of voters want to legalize cannabis for all adults, while a supermajority of voters support medical use and want the federal government to allow states to implement their own cannabis laws. Unfortunately, by keeping marijuana as a Schedule I substance, Uncle Sam puts our communities at greater risk by forcing cannabis businesses to keep too much cash on hand by denying banking access while placing too many obstacles in front of researchers hoping to fully unlock the medicinal properties of the cannabis plant. Despite elected officials lagging behind voters, the cannabis community has made positive strides in recent years at the federal level. The provision prohibiting the use of federal funds to prosecute state-legal medical cannabis providers, now known as the Rohrbacher-Blumenauer Amendment, first passed back in 2014 and a similar proposal for recreational businesses as well, failed to pass by just a handful of votes last year. While it is very unlikely that Booker’s legalization bill will pass this legislative session (especially if Jeff Session remains Donald Trump’s Attorney General), we have seen support and progress for sensible cannabis laws only increase, at both the state and federal levels. I look forward into discussing the present and future of cannabis laws at the International Cannabis Business Conference in Hawaii this December as advocates from across the nation, and globe, will converge upon beautiful Kauai. The ICBC will have those that have been on the front lines of business and politics, with experienced legislators, lawyers, lobbyists and policymakers to discuss how best to succeed in business, and most importantly, best continue our momentum to end federal cannabis prohibition. Donald Trump came into office as a complete wildcard on a number of federal policy issues, cannabis included. During the campaign, he stated that he supported medical marijuana and that legalization should be left up to the states, even though he personally opposed ending prohibition. However, Trump’s authoritarian tendencies and emphasis on law-and-order alarmed many Drug War opponents. The appointment of Reefer Madness Jeff Sessions as attorney general sent shockwaves through the cannabis community, but while the Trump presidency has been extremely chaotic thus far, federal cannabis policy has virtually remained the same as the status quo inherited from the Obama administration. Jeff Sessions has announced a policy change on civil asset forfeiture and called for a comprehensive review of Uncle Sam’s law enforcement policy, including on how the feds should deal with state cannabis laws, but thus far, no news remains good news. The cannabis community recently received some great news on the legislative front as the Senate Appropriations Committee passed a bipartisan amendment prohibiting the Justice Department from using any federal funds to target state-legal medical cannabis providers. While his former Senate colleagues have had Sessions’ back on the attacks he’s faced from Trump, they overwhelmingly rebuked him by tying his hands on enforcing federal marijuana law in medical cannabis states. There has been so much turmoil within the first 6 months or so of the Trump presidency, that it is hard to follow all of the shakeups. It is rather amazing to see a National Security Advisor, Press Secretary, Chief of Staff and Communications Director already kicked to the curb. The chaos on the White House probably bodes well for the cannabis industry as it has to be hard for anyone to really focus too much time on a low law enforcement policy like marijuana with multiple investigations into possible collusion with Russia plague the administration and staff infighting boils over into the media virtually daily. It is no secret that Donald Trump seems hell bent on undoing President Obama’s legacy. While far from perfect, the Obama administration did make some positive strides on criminal justice reform and cannabis policy. While our nation took a step back on asset forfeiture, our federal marijuana policy has maintained the status quo thus far, a good sign all things considering. We still have so much work to be done, starting with access to banking, correcting the IRS code and protecting recreational businesses from federal interference, but by all accounts the future still looks bright for the cannabis industry, despite (or partially thanks to) the turmoil of the Trump administration. No matter what the Trump administration decides on cannabis policy, the industry won’t be stopped and it is important to be informed. The International Cannabis Business Conference is the best place to learn from experts and network with other professionals and advocates. The next ICBC is in Kauai, Hawaii, this December. There are certainly several disputes and controversies within the Oregon cannabis industry and community, but none greater than marijuana testing standards. Last October, stringent testing guidelines went into place, making Oregon regulated cannabis “safer than food.” The standards for Oregon cannabis were so high, that reports surfaced that a vast majority of California cannabis on the shelves at local dispensaries would fail Oregon’s pesticide testing standards. However, those strict standards created shortages and price increases throughout the Oregon market, especially for edibles and extracts. The Oregon Health Authority has proposed new testing regulations, but many feel decreasing testing requirements is bad public policy. For those interested in Oregon’s cannabis testing rules, the Oregon Marijuana Business Conference will cover the latest developments on April 28th, just two days ahead of the April 30th deadline to provide public comment to state regulators on the subject. Proponents of the changes decry foul play by laboratories for overcharging and fixing the rules. They point to the shortage of concentrates and edibles on dispensary shelves as the reason these changes are needed, but after delving deeper into the issue, it appears the current shortage is being driven by pesticide contaminated cannabis, not high prices and a long wait for test results. There are two major provisions of the new rules that are in dispute. One would be to change testing on concentrates from the current levels down to only a single annual random sample from cannabis processors. Concentrates are the most contaminated of all the cannabis products in Oregon. Another rule would dial back the current requirement for at least 33% of the flower batches be tested for pesticides to only 20%. These apply to recreational cannabis only. The current contamination rates are at 10% failure for flower and 26% for concentrates, according to the OHA. Finding the right balance between public safety and workable regulations will always be a struggle. The Oregon cannabis industry has already exceeded projections with thousands of jobs created and millions of dollars generated. I am confident that the state will eventually find the sweet spot on testing standards to ensure safe cannabis in a manner that will allow mom and pops to compete in the market. In the meantime, it is important that folks in the cannabis community get informed and make their voices heard. The OMBC will be a great opportunity to learn and share ideas on how the industry should move forward on testing and a whole host of matters. And no matter where you stand on the issue, make your voices heard by emailing the Oregon Health Authority regarding its proposed testing regulations at publichealth.rules@state.or.us. The Oregon Marijuana Business Conference kicks off the evening of April 27th with a VIP party that will include an appearance by Henry Rollins. All things Oregon marijuana industry related will be covered April 28th. Get you tickets now. My favorite part of helping organize conferences like the International Cannabis Business Conference is learning from cutting edge activists, entrepreneurs and businesses from around the world. One of my biggest goals for the ICBC in Berlin, which has attendees from more than 35 countries in attendance, is highlighting the German medical cannabis provision that covers patients’ medicinal marijuana thru insurance coverage. I was fortunate to have the opportunity to catch up with Leafly’s Linn Baumgardt who was literally on her way to Berlin. Linn is speaking on Wednesday, April 12th, at noon on the ICBC’s Consumer and Tech Branding Panel. Leafly, of course, has been a leader in helping patients and consumers learn about cannabis strains and dispensaries around the world and it was a pleasure learning a bit more about the company’s plans for Germany. Anthony Johnson: What is your position and duties with Leafly? Linn Baumgardt: I’m the Director of Strategic Initiatives. I’m responsible for the expansion of Leafly into Germany, a burgeoning medical cannabis country that is helping the global movement to legalize medical cannabis in Europe, and around the world. What are Leafly’s plans for the Germany expansion? Leafly.com is available in every country. However, we will be launching Leafly.de in May 2017. Leafly.de will look and function differently from the US website, as there are currently no dispensaries in Germany. Medical cannabis is a new topic to many Germans, and Leafly.de will serve as a competent and trustworthy informational resource for German speaking patients, doctors, pharmacists, and adults who are interested in learning more about the topic. Germany’s plan is to start having medical cannabis covered by health insurance, do you think that this would be a good approach for other countries? It will be interesting to see how this will be implemented by doctors and health insurers. Germany’s health insurers may cover medical cannabis prescriptions for the “seriously ill” as stated in the new law. Rather than creating a new legal category for cannabis (the way US states and Canada are doing it,) Germany is modifying their narcotics prescription medication law to include cannabis. If other countries go down the same path as Germany, it would make sense for them to look at what is working in the German system and adapt similar practices accordingly. Have you heard good feedback from patients and customers about Leafly’s services? One of the reasons we are launching Leafly.de is that we are hearing of an overwhelming need for information from German patients, medical practitioners, media, and regulators. While there are activist groups in Germany that have been very passionate and vocal about the topic for a long time, for mainstream Germans this is new territory. We are very excited to launch Leafly.de and get feedback on what our site visitors like and what they would like us to add on and develop. Thank you very much for your time and I look forward to meeting you and hearing more about Leafly’s innovative expansion plan for Germany. The last few months has seen a flurry of activity with regard to congressional support for modifications to the laws governing medical marijuana in the United States of America. So much so that that a bipartisan US Congressional Delegation is heading to Europe next week to study the various drug policies and regulatory systems that are currently in place in several countries in Europe today. The trip caps off in Berlin at the International Cannabis Business Conference (ICBC). Germany has recently legalized medical marijuana and is expected to have an industry bigger than Canada’s within just a few years. As Germany’s Cannabis Agency is being established, and other kinks in the new cannabis laws get ironed out, the visit from the representatives comes at an auspicious time. “We are more than excited to have the bipartisan delegation at our event,” says Alex Rogers, founder and producer of the International Cannabis Business Conference (ICBC). 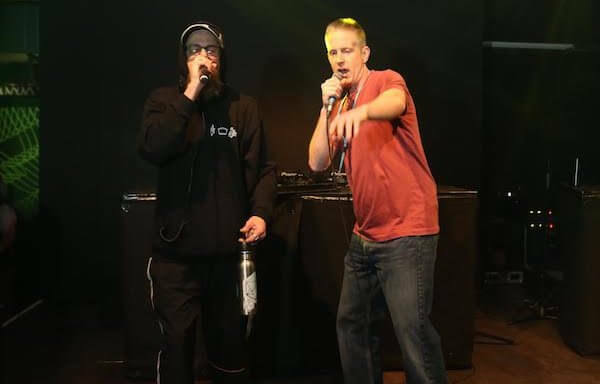 “Our goal is to connect and educate people in the industry, as well as help move cannabis policy forward in all of the places around the world we do our events”. Don’t Miss MedCann Founder Pierre Debs at the ICBC in Berlin!